One of the fundamental underpinnings of the legal Foreign Exchange Marketplace is the trade of currencies for their official, government set trading rate. This places everybody on the same footing, government and citizen alike. When a bank, company or person buys a currency for less than its accepted international value, it is an illegal act under international law. The law is designed to keep currencies stabilized by preventing a recursive loop of profit gaining. For example, Jim lives in Country-A, but travels to Country-B regularly. Country -A is experiencing an inflationary cycle in which its currency is trading, officially at a better rate abroad than it actually is able to be traded for domestically. Country-B, however, has a stable, internationally accepted currency. In this example, the official trading rate is 4 Country-A Dollars to 1 Country-B Dinero. On the street however, the Country-A dollar is only worth 1/8th of a Country-B Dinero. Jim travels to Country-B where he uses his official credit from Country-A, to purchase Country-B Dollars. He pays the official Country-B rate of 1/4th per Dinero. He purchases 1000 Dinero, for 4000 Dollars. Jim travels back to Country-A, where he buys Dollars at a rate of 8 Dollars to 1 Dinero. He gathers 8000 dollars for his 1000 Dinero. He pays off his credit and his trip with the official rate of dollars and pockets the rest as a profit of 3000 Dollars. This is an example of Illegal Arbitrage, and is the underpinnings of the black market trade in currency. Since Jim can now return to Country B and use his profits and his credit to purchase more foreign Diero, he strengthens the Dinero and further weakens the domestic Dollar. This problem, the illegal shifting of currency is rife in areas with weak currency or heavy black markets, such as Central America, the Middle East, China, Africa and South East Asia. 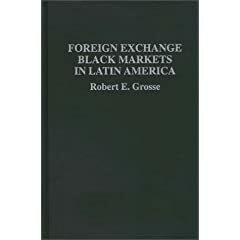 In the book Foreign Exchange Black Markets in Latin America, Authored by Robert E. Grosse, the illegal foreign exchange markets in many Latin American countries such as Argentina, Brazil, Colombia, Jamaica and Peru were studied for several years, with the period of detail ranging from 1990 to 1993. This book organizes a group of case studies to present a wide and detailed view of the scope of illegal arbitage in Latin American at the beginning of the 1990s. This book cannot be considered a economic analysis in any traditional sense since black markets are illegal by definition. Black markets have no official statistics that can be tracked and all data is, by necessity, empirical and the active traders attempt to maintain a low profile. These factors notwithstanding, such markets are widely used and understood by people living in the Latin American countries, allowing a reasonably accurate picture of them to be presented.